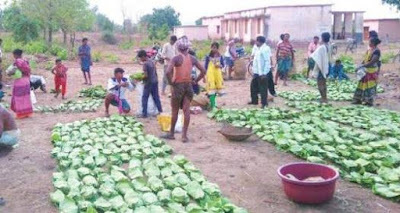 Well-known civil rights organization, National Campaign for Survival and Dignity (CSD), has urged Naveen Patnaik, chief minister of Odisha, to allow six tribal gram sabhas to resume their kendu leaves business. In a letter, CSD has blamed the state forest officials for "violating" Forest Rights Act (FRA), 2006 by "interfering" the gram sabhas seeking to trade in the leaves. Six villages, Kalipur, Kanakpur, Kasturapadar, Jamjharan, Jamgudabahali and Khasiguda, all of the Golamunda block of Kalahandi district, started kendu leaf collection in the first week of May 2017 and contacted a kendu leaf businessman from Maharashtra and even entered into business contract. But, according to CSD, forest officials in the district "obstructed their business activities and refused to allow them to sell their produce saying kendu trade is nationalised in the state." At the same time, it added, "Forest department officials also threatened the Maharashtra businessman who had done business contract with the six gram sabhas." As a result, said CSD, the businessman left the leaves the tribals had collected and the villagers are now running pillar to post to dispose of the collected leaves. Referring to the July 3 letter sent by Jual Oram, Union minister for tribal affairs, to Patnaik to "resolve the issue of six villages", CSD said, despite the letter, "till date forest officials of the area continue to maintain their stand and have not allowed the six gram sabhas to resumes the business." The CSD further said, the forest department of Odisha has also ignored the July 22 letter vide No 13125, which mentions violation of FRA, 2006 by a Kalahandi forest official who has been "obstructing" kendu leave business being carried out by the six gram sabhas. "In light of the requirements of law in this situation, and given your own stated position on the issue, we call upon your government to immediately direct the forest department to halt its illegal obstruction of the rights of the six villages. If this is not done soon, these villages will lose lakhs of rupees worth of revenue this year", the letter warned. A national platform of adivasi and forest dwellers' organisations from 11 states, CSD has been closely involved in the struggle for the enactment and enforcement of the FRA, 2006. Calling the forest officials ways "a matter of grave concern", the letter said, the villagers have been "fighting for the right to freely sell the kendu leaves that they collect" for quite time, asking Patnaik to ensure that the forest department halts "its illegal obstruction of the rights of the six villages".